This post is sponsored by Wheatsville Food Co-op. As always, all thoughts and opinions are my own. I've worn a cardigan two mornings in a row....and even though I've had to shift to A/C on my commute home each day....I'm calling it; I think it's Texas Fall y'all! 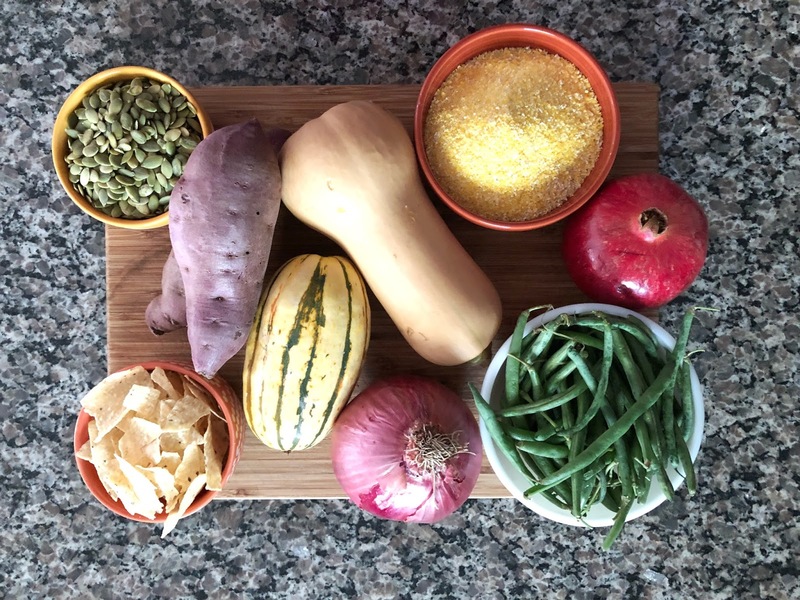 Which means my meals are shifting towards winter squash, pomegranate seeds, soups & all the sweet potatoes I can manage. 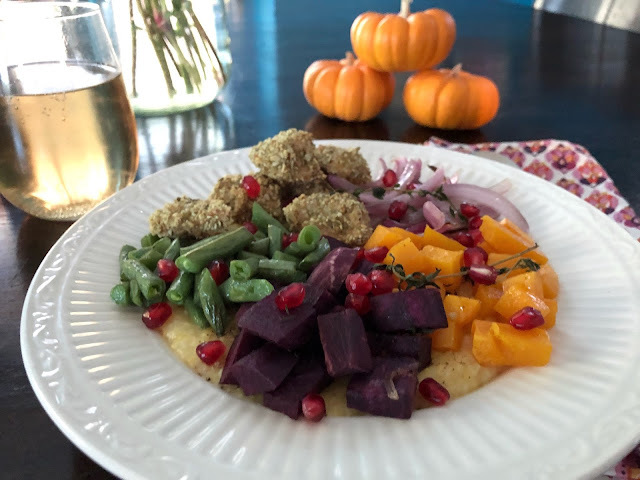 These cheesy, creamy polenta bowls are overflowing with warm, roasted seasonal veggies, & finished off with a sweet zing from pomegranate seeds; one of my favorite ways to add a bit of fall to any dish. 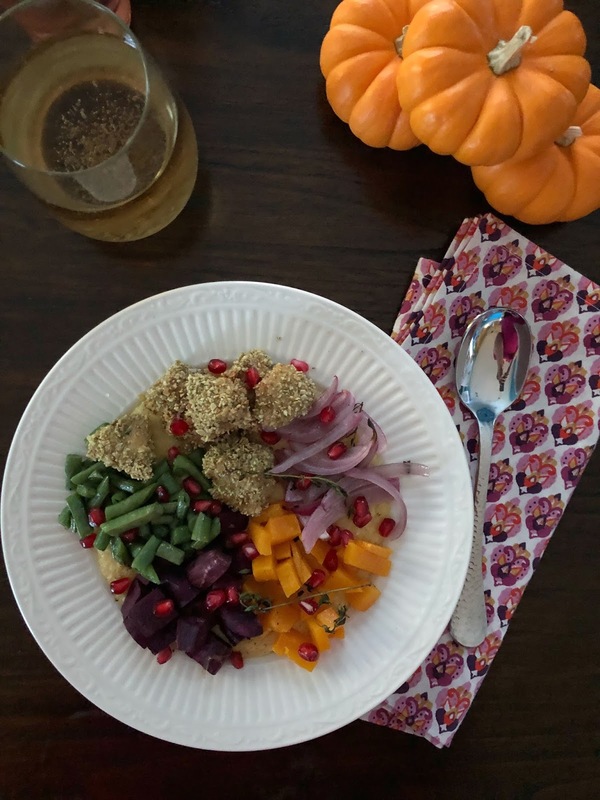 Pumpkin seed & tortilla chip covered chicken bites round out the bowl & I really love how they turned out. Just a bit crunchy & even though they are oven baked, there was no soggy breading to be found. And to season everything, I used fresh thyme. Fresh herbs have become such a go-to in my kitchen. I love the earthiness & flavor they add to dishes. 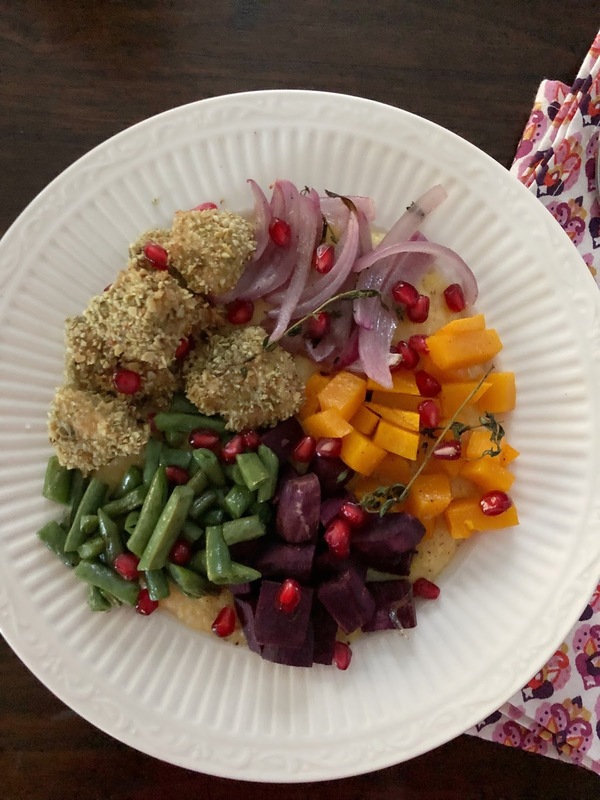 When I was creating this recipe, I wanted to make it quick enough for a weeknight, so I decided to cook everything but the polenta on a sheet pan. Wow, there's really something to sheet pan dinners. Chop everything, including the chicken, into small pieces & everything is on the table in about 30 minutes. Hard to beat. One of my favorite places to get delicious, often local, mostly organic, fall veggies is Wheatsville Food Co-op. They always have a super fresh selection of produce & I just feel healthier when I step inside. You really can't get any more 'Austin' than Wheatsville. They are the only retail food co-op in Texas & opened their doors in the Capital City in 1976, with a focus on local, organic, sustainable food options. Last week, Andrew & I popped in to the South Lamar Wheatsville location with a mission: polenta bowls topped with as many roasted, seasonal veggies as I could. Pumpkin-seed crusted chicken bites were also on the menu. We've been wanting to try making our own breaded chicken for a while & I thought it would pair well with the fall produce & comforting, Parmesan filled polenta. 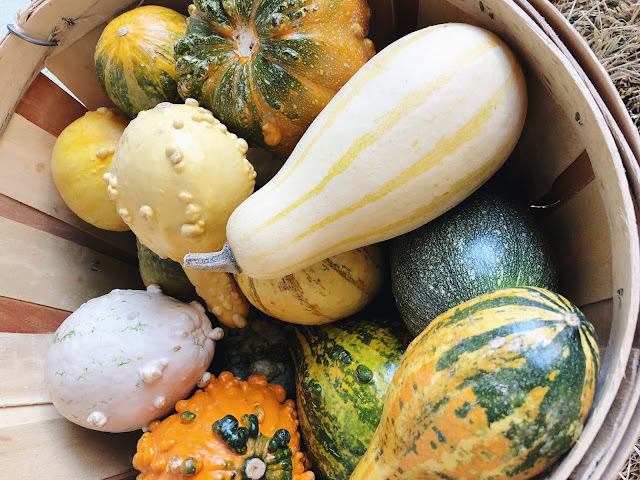 Wheatsville had a ton of ripe fall produce that we quickly added to our cart, along with a package of pre-marinated chicken breast. I thought the Wheatsville Chipotle Garlic & Honey Marinated Chicken Breast would go perfectly with the pumpkin seed/tortilla chip crust I was planning. Bingo! The slight spice from the chipotle & the sweet honey made for a super moist, flavor-packed bite. And I love that Wheatsville has these marinated packages ready to go. We're not great about remembering to marinate, but it's an important step to getting tender, tasty meat. They made it easy. We then stopped by the bulk isle & grabbed some polenta & pumpkin seeds. Bulk bins are my favorite, because you can get just the right amount for a meal. And the prices are usually much better than what you can get in a package! Millagro tortilla chips, made right here in Austin, also went in the cart. 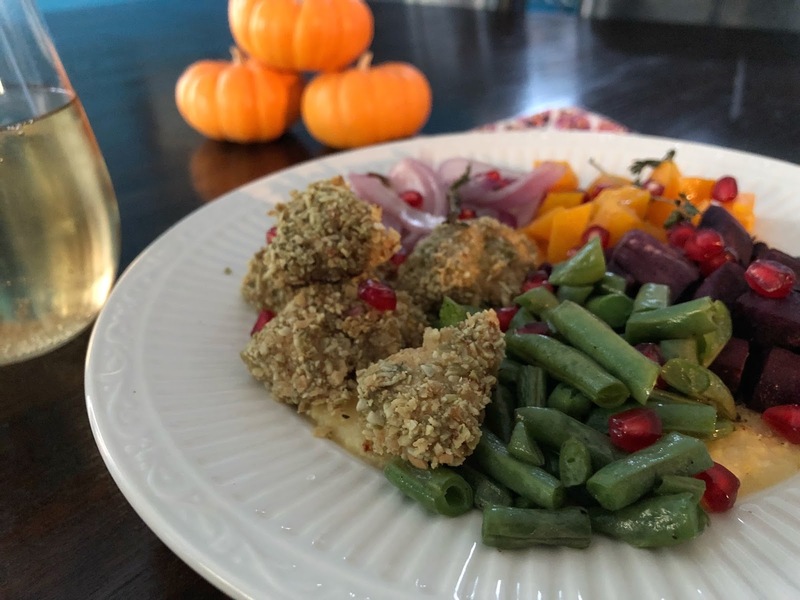 I blended them with the pumpkin seeds & they added just the right pop of crunch to the chicken bites. I'm giving away a $30 giftcard to Wheastville Food Co-op over on my instagram account (@homemadeaustin). Head over any time before Monday, October 30th at 10pm &, look for the photo that says Wheatsville Contest! on it to enter to win! Boil water or stock for polenta, turn oven to 400 degrees. Grease a large sheet pan. Dice chicken, & create a dredging station. In one bowl, beat eggs, milk, salt, pepper & a few fresh thyme sprigs, stems removed. Grind together pumpkin seeds & tortilla chips using a food processor, then pour into a separate bowl. Season with salt & pepper. Dredge chicken in egg mixture, then seed/chip mixture, making sure to cover each piece fully in crumbs. Transfer each piece to the sheet pan, keeping them all in the middle. Dice all veggies, then toss with olive oil, fresh thyme, salt & pepper. Arrange on sheet pan. Note: you can toss each vegetable with olive oil, spices & herbs & arrange separately, or mix them all together. Bake veggies & chicken until chicken is completely cooked through, 25-35 minutes. Cook polenta according to package directions. Once cooked, whisk in butter, Parmesan, salt & pepper. Spoon polenta into bowls, then arrange chicken & veggies on top. Sprinkle with pomegranate seeds. I wanted to give y'all a little peek into my week, with a new series I'm starting called 'Week-ending.' It's a sampling of things I'm obsessing over, the open tabs on my iPad, recipes I'm trying, what's going on in Austin & more. Have something I need to try/buy/read? Let me know in the comments, I'm always looking for new loves. I'm don't usually crave cold treats (I prefer my sugar in cookie form) but I need to make this ice cream from AwwSam to survive Summer. Foam Rollers. I've had one for a while, used it off & on, but recently my neck/back have been killing me. It's now my new best friend. Check out some beginner tips here. This print from TalulaChristian's etsy page just made my wish list. Little by little I've been creating a gallery wall of fierce lady art in my bathroom & this print needs a spot in the collection. Daily commutes are infinitely better & much more nostalgic now that I've discovered the Fan Girl Fridays Podcast. They discuss all kinds of TV, but focus on shows from the 90s & my inner teenager is LOVING IT! They've inspired me to re-watch Daria with Andrew, which is more awesome than I even remember. This floral & succulent themed party from Kara at A Kalio Chic Life is making me want to have a get-together ASAP. Speaking of parties, I have a couple of upcoming baby showers to attend & the new Oh Joy! baby clothing collection at Target is bright, completely adorable & must be included in the next few baby gifts I buy. 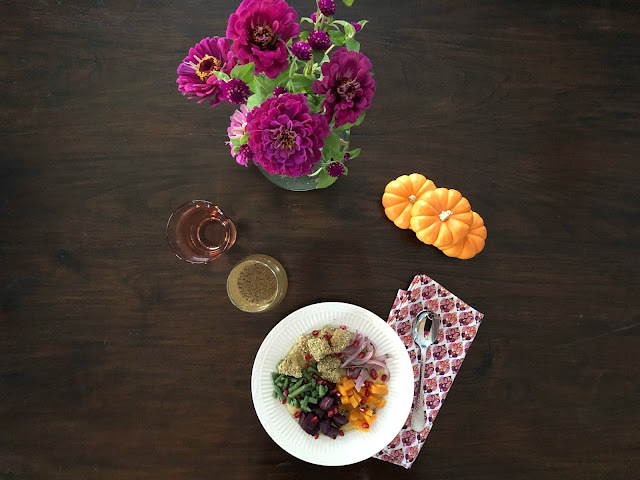 Making meals during the week can be so hit or miss, but I'm hoping putting our weekly run-down on the blog will help me be motivated to cook a real dinner. Monday: Went with a quick & easy go-to: toast with pesto, prosciutto, cherry tomatoes & fresh mozzarella, melted for just a minute under the broiler. Delicious & comes together in a minute. Tuesday: We tried a new recipe: Chicken & Spinach Saagwala from Beth Behrs new book, Me-Tox. It was very tasty & I'm so glad I tried something new! The meal was slightly intense for a spice wimp like me, without much experience with Indian flavors, but it was delicious. Wednesday: On Tuesday, we grilled several chicken breasts, so tonight was Tex Mex Bowls: rice with black beans, leftover chicken, sauteed onions & peppers, avocado, feta & a quick cilantro/yogurt/lemon (outta limes!) sauce. I love this kind of 'kitchen sink' meal. Thursday: I had a Austin Food Blogger's Alliance happy hour at Sophia's on West 6th, so dinner was appetizers, drinks & dessert. I love these monthly get-togethers with my foodie friends & the bites were great. My favorites were the bruschetta (above) & the butter cake. Friday: I picked up groceries earlier in the week for this Lemony Pesto Pasta with Edamame & Almonds recipe from kitchn, but I'm not sure we'll make it tonight. It's been a long week & energy is in short supply. If it doesn't get made tonight, we will have it over the weekend. Food Crawl! I've been itching to try some of my friend Linda's picks for the best Tater Tots in Austin. Check out her tour at Girl Eats World. It's damn hot outside, which is a great excuse to start a new book! Half Price Books is running an awesome coupon sale through July 16th & I may have to pick up something new. Sign up to receive their coupons here. Not happening this week, but my *favorite* comic, Whitney Cummings is going on a tour to promote her new book & tickets for her October 16th show at the Paramount go on-sale today....I'm so excited! Charred corn is one of our favorite summer go-tos. It's so easy to make & it pairs with almost anything. Not to mention, corn is cheap, cheap in the summer months. We grill up several pieces at once on Sunday & use them all week long in salads, as-is, or our new obsession...as an awesome pizza topper! The burnt bits of the corn & grilled red onions are full of smoky flavor & the tomatoes, lime & basil add a pop of bright freshness. If you're not a basil fan, you could totally swap that out for cilantro & it would be just as delicious. We have only eaten the pizza by ourselves so far, but I think that if you sliced it into smaller pieces, it would make the perfect appetizer for a fajita night with friends. (Mentally adding that to my to-do list now). Preheat oven and pizza stone to 475 degrees. Flour your surface and roll out dough thin to form a circle about 12 inches or so in diameter. Poke a few holes in your dough with a fork & spray dough with olive oil spray. Top liberally with mozzarella cheese, then add charred corn, onions & tomatoes. Bake on pizza stone for 6 - 8 minutes, until cheese starts to bubble & the dough begins to brown. Top with squeeze of lime, sprinkling of parmesan & chopped basil. Slice & serve immediately. As a kid, I was never really sheltered from dessert. I grew up with a fine appreciate for sweets, especially homemade. Often on the weekends, my mom would make cobblers, pies or cookies & we would d-e-v-o-u-r them. My mom was a great cook, but she really loved baking. Her love of sugary confections showed in every cookie, slice & spoonful that came out of her oven. I've told you a little bit about her famous sugar cookies before on the blog. So, I blame my deep affection for cookies on her. :) As part of the AFBA City Guide this year, I decided to tell you about some of my favorite cookies around Austin. Because, we could all use a treat now & then, right? If you want true Austin charm in cookie form, look no further than Baked by Amy's. You have to try their Austin-centric, Texas shaped sugar cookies. 1. They are absolutely adorable, with 'your my better half,' 'i love you so much,' 'don't mess with Texas' & plenty of other fun Austin designs. 2. They are some of the best bakery sugar cookies I have ever had! These guys are thick, but surprisingly soft, with a great flavor. Bonus: These cookies come packaged, so they would be perfect for a mid-week treat for loved ones or an Austin-themed basket for someone missing the River City! A local favorite of ours, Crema always has a full case of beautiful sweet treats. Nestled in a little shopping center on Brodie Lane, Crema is a fun place to sit & read a book, while satisfying your sweet tooth. Try the oatmeal cookie with a latte & you'll be happy. I'm also partial to their chocolate chip, or on occasion, their decorated shortbread. You really can't go wrong with anything from their case. This sweet, colorful shop on Burnet Rd. brings the goods. Try the Brookie, for a decadent, shareable bite. This stellar treat is a brownie, topped with a chocolate chip cookie, covered in marshmallow goodness. Droll worthy, right? Now, when it comes to something you'll want to save all for yourself...try the Peanut Butter or chocolate chip cookie stuffed with caramel & chocolate. They're large & most definitely in charge. If you've never been to a Mexican bakery, I highly recommend trying La Mexicana Bakery on S. 1st. It's open 24 hours & always has smiling faces behind the counter. I love La Mexicana because their cookies are just slightly sweet (which means you can eat more!) & always so bright & colorful. I always go for the ones with sprinkles, or Mexican wedding cookies. With fun combos like Peanut Butter Chocolate Chunk, Nutella filled Tea Cookies & Chocolate Ginger, Quack's cookies are perfect if you're wanting to try something new. And the hearty dose of laid-back Austin attitude makes you feel right at home. They also have ever-changing decorated cookies, that are always cute & original. You have to try one, & just to rub it in that you're eating something so tasty...you gotta instagram it. Sugar Mama's Mexican Wedding Cookies may be one of my favorite cookies. They are soft, tender, buttery, full of pecan pieces & just the right size. You need to try these; while strolling down S. 1st street with a good cup of coffee in one hand, & your cookie in the other. Also, make sure you pick up a Salted Caramel Snickerdoodle & an Everything Cookie, filled with peanut butter, oats & chocolate. An Austin institution, Sweetish Hill has been a go-to of mine for years. Their cute shop is along the quieter side West 6th street & is a wonderful place to spend some time. I love their nutty, pecan-filled sand tarts & of course, the 'Deep in the Heart of Texas' shortbread. Also try the black & white or the palmier. A great afternoon can be spent sipping a cup of coffee with a salty oats cookie on your plate, sitting in one of the outdoor tables with a little sun shining. After enjoying your sweet Walton's treat, I recommend walking through Book People, Whole Foods or Waterloo Records, as they're all within eye-sight. And take a ginger cookie with you for later, they are over-sized, chewy, sweet & zingy. Be sure to check out the rest of the AFBA City Guides that cover great places throughout the city! A few years ago, when we moved in to our first 'real' home in deep, deep South Austin (almost in Manchaca, but still rooted in Austin), there was very little in the way of local restaurants in our neighborhood. Or good restaurants for that matter. Fast food chains & a couple of not-so-good take out places seemed to be our only options. Recently, though, delicious Austin-owned eateries have been popping up all over between William Cannon & Slaughter Lane, keeping our bellies & mouths happy! And if the last few months have been any indication, we are hopeful that many more restaurants are on their way. Aviator Pizza, South Congress Ave.
Below are my picks for great eats in deep South Austin. What are yours? I'm always looking for great places that are close, so if I've left off your favorite, please let me know! And if you're looking for more tasty fare that's a little further North, but still firmly in South Austin, check out South Austin Foodie's awesome addition to the 2017 AFBA City Guide, Best of South Austin Restaurants. You can also check out the rest of the AFBA City Guides that cover great eats throughout the city, here! Solid breakfast/brunch options, delicious pastries & a good cup of joe. With a large variety of cake balls, cookies & cupcakes that'll sooth your sweet tooth, you'll leave with a smile on your face. They also serve up tasty sandwiches, salads & soups. Austin weird meets arguably the best breakfast in town. They have a full menu, but their omelets, varieties of eggs benedict & pancakes are tops. Plus, it's fun to have breakfast anytime. With weekly flapjack specials, seasonal menus, lots of vegan options & dang good queso, they've got something for everyone. Try the baked potato omelet, a sandwich with sweet potato fries off the seasonal menu or the buttermilk pancakes with lots of butter. No syrup needed. Simple, tasty, consistent donuts & sausage kolaches. Strike up conversation with the older men drinking coffee while you're waiting in line & make sure you get at least a few of the Bavarian cream donut holes. They're worth the calories. Inexpensive traditional Tex-Mex known for their breakfast tacos, lunch specials & more. The juevos rancheros is my go-to, along with the make-your-own breakfast tacos. The service is always friendly, and while there is alot of seating, it fills up around popular breakfast hours, so be prepared to wait a few minutes. Incredible, no frills New York style bagels & delicious specialty cream cheeses. Many claim Wholy Bagel to be best in town. Very few would argue. Be sure to get there early to make sure you get your favorite flavor! Very limited seating, but lots of parking. You'll find all of your Greek favorites with quick service. I usually go for the Vegetarian Platter which includes 5 sides of your choice. The falafel & hummus are always among my picks. Killer queso, inventive tacos & fried deep fried chocolate chips cookies. Bonus: real sugar sodas from Maine Root. There's lots of seating, but be prepared...it will be packed if you go around standard meal times. Try whatever the taco of the month is. The Scarecrow, a frequent October pick, is my favorite taco. Ever. In a shady little oasis sits Thicket, a fun food trailer park just off of South 1st & Dittmar. There are several stellar food trailers, including Granny's Kitchen, specializing in comfort food that will warm your belly & your heart. Try their Chicken & Dumplings, with a side of mac & cheese & it'll definitely take you back to dinners at your grandparents house. Their is an amazingly delicious variety of grilled cheese sandwiches at Grilled Chi & you have to try a drink for the coolest trailer around, Level Up. True Original Austin, ThunderCloud Subs, embraces Austin weird, friendly service & boasts a large list of above average sandwiches that are always fresh. Thundercloud is one of my husband Andrew's favorite go-tos for a quick meal. Say yes to Thunder Sauce. 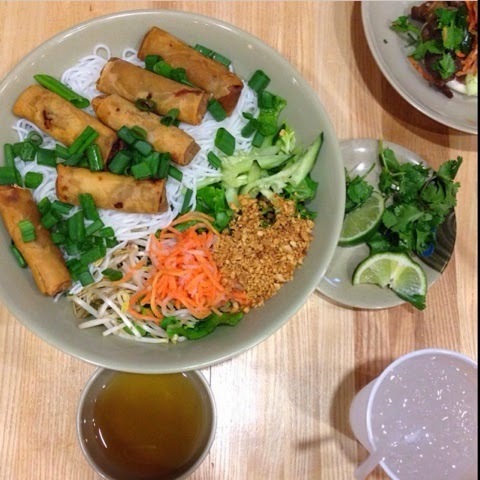 Tasty Vietnamese fare including build-your-own Pho, vegetarian goodies & a wide variety of drink choices. Try the bahn mi sliders as an appetizer to share or a light lunch. The Vietnamese coffee and The '403' with shrimp, wontons, bok choy & egg noodles are among my favorites. Dependable Asian food available for delivery, dine-in or drive-thru. The service is always friendly & quick & their Cantonese Crispy Noodles are the perfect comfort food. They also make a killer General Tso's chicken & my trip is never complete without getting an order of Crab Won Tons. Traditional Texas BBQ, Southern favorites & daily specials. The meat is good & the sides are tasty. Delicious pizzas, calzones, salads & more made with natural & preservative-free ingredients. Available for delivery, carry out or dine-in, but their seating is very limited. 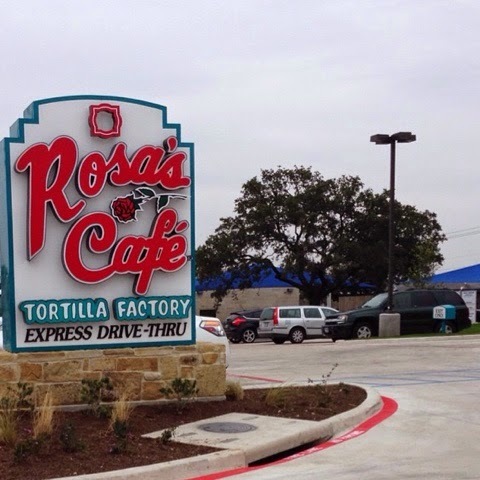 I am pretty biased, as Rosa's is a West Texas staple that kept me sustained throughout most of my college years at Texas Tech, but they are a Texas-based chain, so I'm mentioning it. Solid, stand Tex-Mex dishes done quick, & more importantly, drive-thru friendly. Their fajita family plate, guacamole & fresh tortillas are among my go-tos. If you're looking for an enchilada, a quick queso fix or a good Taco Tuesday deal, Rosa's is your new friend. Famous for good reason. Valentina's recently moved down to my neighborhood & we could not be more elated. A hybrid of two Texas traditions done right. I recommend the Ultimate Bean & Cheese, for a taco that's filled with BBQ, beans, cheese & salsa. It will leave you satisfied for hours. Also, always order the guac, because...guac! Be sure to get there early, as the secret is out about just how good Valentina's is. Aviator is new to the deep South Austin scene, and it is worth checking out. Their pizzas are fresh, with a nice thick crust & a long list of fun topping combos. 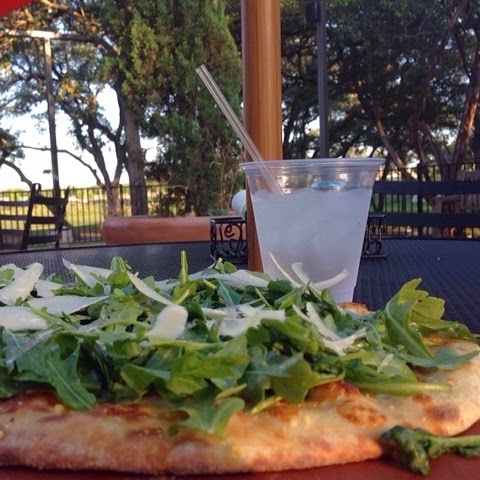 We love the South Austin, with prosciutto, arugula, goat cheese & honey. It's a tasty twist on a classic. Also be sure to try the hearty salads, calzones & the cinnamon pecan dessert. And don't forget about the beers & wines on-tap. 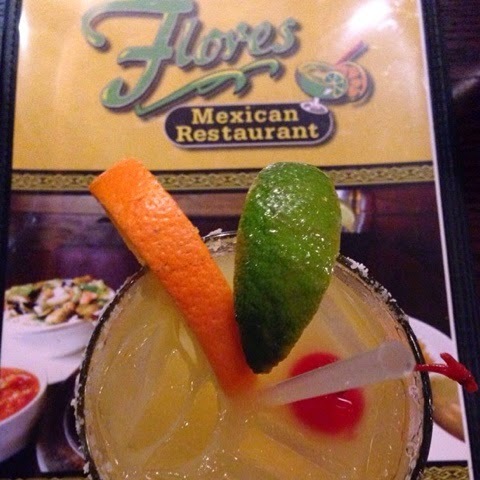 An old favorite, Flores is great for happy hour margaritas & queso, or an easy meal out with the family. Their William Cannon location is nice & new, with rustic decor touches, plenty of seating, with a large bar & even a playground for the kiddos. I love their combo plates & the La Flor Margarita, with a splash of orange juice & a cherry on top. All of your standards, plus an extensive list of veggie options, Hao Hao has been a Mullins family favorite for years. The service is friendly, and their delivery is quick. A wide selection of pastas, thin-crust pizzas, small bites, desserts & coffees. They have two large dining areas, a small market full of Italian goods & bocce ball on the patio. Try the parma pizza, calamari & zucchini fritti for quick bite, or the lemon ricotta cookies with a fresh coffee for dessert. A variety of salads, soups, desserts, coffees & other offerings available from the deli counter as well as a rotating carving-station meal for evening service. Their meats are locally sourced & as your taste buds will confirm, everything is made fresh. Sandwiches, burgers & breakfast options served daily. Try the juicy burger with truffle fries or anything from the bakery case. Tex-mex usuals, but the crispy beef tacos are the stand-out on the menu. Sometimes I get enchiladas too, but I always have a taco. Always. Puffy, hearty corn tortillas take these old favorites to a new level. Detroit style pizza that is one of our favorites in town. Large square slices with crispy, cheesy edges & sauce on top, these unique slices are perfection every time. I have a soft spot for the Rocket, with Soppresatta, Arugula & Shaved Parm, but I also love a good slice of The Stooges, bar style (thin, crispy crust) with Artichokes, Spinach, Shallots & Parm Crisps.